We live in a world of abundancy. There is a plenty for everybody: green forests, tender sun, refreshing wind, , fragrant rains, anything a human being has ever needed to live in harmony with himself and his environment. Still, nowadays we are using more and more energy day by day. According to Deep web, the documentary featuring the impact of information technology on a mankind, actually there are more devices connected to the web than human beings that live on the Earth! Just imagine, how accelerated should be the rhythm of energy-production to keep it all working! Your device needs energy, energy is needed to send and receive energy, energy is needed to store information on servers. Keep in mind that almost every unit of information ever existing is backed up. That means that even more servers are needed. There is the same quantity of energy required to keep the server working as to keep a substation running. The servers produce heat when they are operating, so there is a necessity for a climate control and cooler facilities to be installed. They also require energy for performing their functions. Resources, normally used for energy supply are called finite fossil resources. If you think about that, resources cannot be finite. The thing is that we consume the existing resources faster than they are being created. For instance, oil is a product of decomposition of small organisms, animals and plants (plankton), that lived millions of years ago. As it accords to Detlev Leythaeuser, geology professor at the university of Köln, oil formation (the origin of oil) is a staged, long process of formation and accumulation of oil in the earth's crust. Have you known that the oil formation process took from 50 to 350 million years? Have you ever thought of the day, there will be no oil to use any more? It is true, that energy does not disappear anywhere. It just takes long time for resources to get restored. 350 million years are not just carrots! Fortunately, as we all know, according to the law of conservation of energy, the energy can neither be created nor destroyed; rather, it can only be transformed from one form to another. The fact that nowadays we need lots of energy does not mean that we need to stop using it. I´d rather say we need to shift our focus from "using" to "transforming". In this article I will try to review smart ways of using energy. Let’s take a look at the transformational innovations that have been invented for the last 10 years in the scope of green energy. Invented by German Architect Andre Broessel, it can accumulate sun energy even during the night hours and in low-light regions. 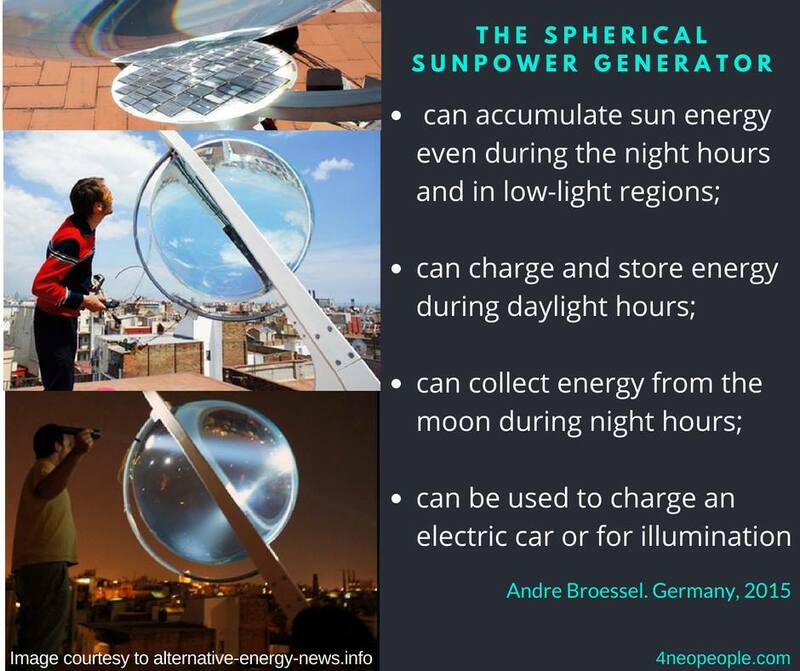 This spherical sun power generator combines spherical geometry principles with a dual axis tracking system, allowing twice the yield of a conventional solar panel in a much smaller surface area. The modular collector system can charge and store energy during daylight hours and can even collect energy from the moon during night hours. A hybrid collector converts daily electricity and thermal energy at the same time. The core of this innovation is a Ball Lens, a point focusing concentrator. At nighttime the Ball Lens can transform into a high-power lamp. It can be used to charge an electric car or for illumination simply by using a few LED’s. 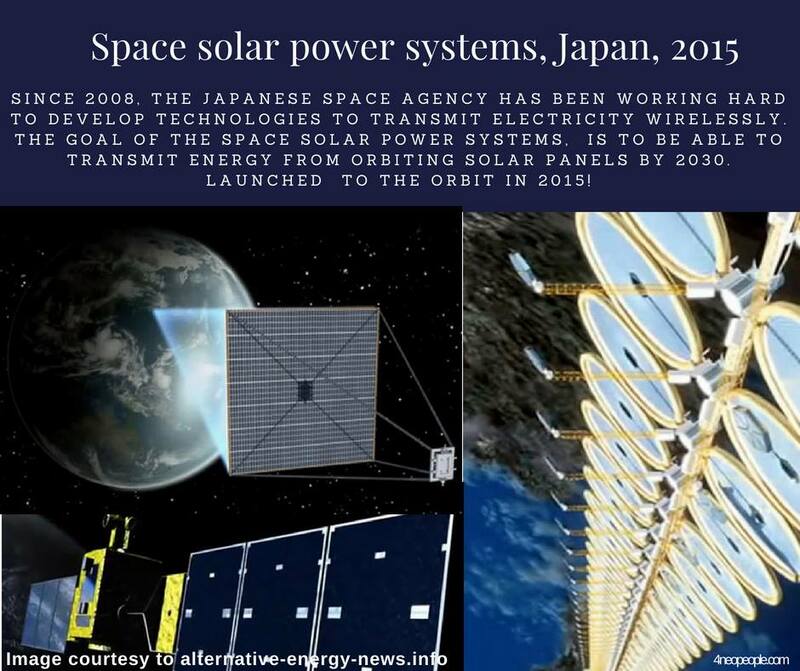 Since 2008, the Japanese Space Agency has been working hard to develop technologies to transmit electricity wirelessly. The goal of the Space Solar Power Systems, is to be able to transmit energy from orbiting solar panels by 2030. On March 12th, Mitsubishi Heavy Industries, Ltd. successfully conducted a ground demonstration test of “wireless power transmission”, a technology that will serve as the basis for the SSPS. The new test results promise to lead to way to terrestrial applications like the SSPS, and will hopefully eliminate the need for traditional cable connections. Potentially, a solar battery in orbit (36,000 kilometers above earth) could generate power which would then be transmitted to earth via microwave/laser, without relying on cables. Japanese Space Agency anticipates that this new technology could become a mainstay energy source that will simultaneously solve both environmental and energy issues here on Earth. CO2 is a main byproduct of industrial power generation that involves the burning of fossil fuel. The wasted gas is a greenhouse agent and is generated in enormous volumes every single year. Therefore, it has become important to find a way to capture and reuse that wasted gas. As it accords to Jon Wilkstrom, US environmental writer, several companies are becoming creative in the ways of CO2 recycle. The carbon dioxide used once is captured from coal plant fumes. Later on, it is used for different things. Among them you can find a Dry CO2 cleaning, that is a technology that utilizes recycled carbon dioxide in a number of creative industrial applications. The recycled gas can also be used for cooling machine tools, cleaning complex medical instruments and electronic devices, selective extraction and even eco-friendly dry cleaning. The solutions can be applied in a number of different industries including solar energy, fiber optics, original equipment manufacturing and semi-conductors. The added environmental benefit is that it helps manufacturers avoid using and disposing of millions of gallons of water. I will continue to feature innovations that have been here for years, but yet they are still not that known. Some of them are being beta-tested and it is impossible to predict the definite results and outcomes. Still, there are lots of people who are working in the scope of alternative energy. Let´s hope that together we will make this alternative happen.